But just as Wynne thinks all her dreams are coming true, her ex-boyfriend walks back into her life at the worst possible time. Steve broke her heart years ago, and she's still sorting through her feelings for him. Her heart isn't as clear as her head that it's past time to move on---even though she's engaged to Andy. At a local TV talk show appearance, Wynne meets Meredith, who won another reality TV show---Marathon Mom---proving herself nothing short of a superhero. As Wynne's beach wedding plans spin out of control, Meredith offers to help, unknowingly stepping on Wynne's secret feelings . . . and exposing some secrets Meredith has been keeping to herself. Can these two reality stars get real about their feelings? 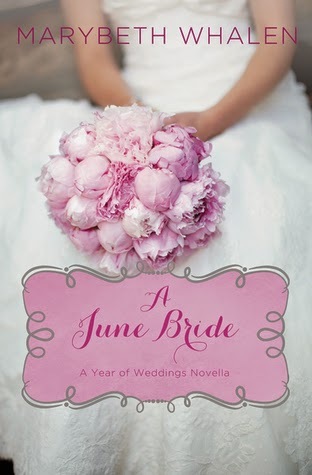 Will Wynne go through with her televised wedding and be the perfect June bride the network is looking for? As I read this book I struggled to figure out which guy I was supposed to be rooting for. As a result I didn't connect with either of them, and resented the main character Wynne for leading both men on. Reality TV always leaves me with a bad taste, so I didn't enjoy that aspect of the plot. It was enlightening to read about Wynne's disillusionment and changed perspective on the reality behind reality TV. When Macy Dillon was five years old her father encouraged her to draw a picture in the guestbook of a Carolina beach house. The next year, Macy returned to discover a drawing by an unidentified little boy on the facing page. Over the next eleven years the children continue to exchange drawings ... until tragedy ends visits to the beach house altogether. During her final trip to Sunset, Macy asks her anonymous friend to draw her one last picture and tells him where to hide the guest book in hopes that one day she will return to find it---and him. Twenty-five years after that first picture, Macy is back at Sunset Beach---this time toting a broken family and a hurting heart. One night, alone by the ocean, Macy asks God to help her find the boy she never forgot, the one whose beautiful pictures touched something deep inside of her. Will she ever find him? 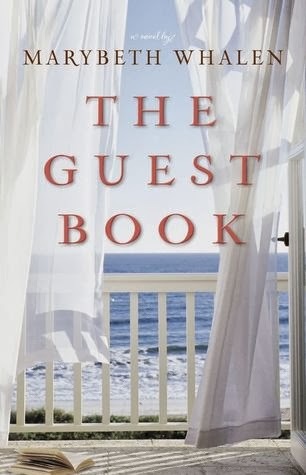 And if she does, will the guestbook unite them or merely be the relic of a lost childhood? This was a bit of a messy all-over-the-place book for me. Macy was dealing with (or avoiding dealing with) several issues, including grief over her father's death, her relationship with her mother, disapproval over her mother's way of dealing with grief, her brother's partying, being a single mother, dealing with her ex who had abandoned her with a newborn coming back to town after five years... and that's just the first few chapters. As the novel progresses, add on four men who are pursuing her each of which she is strongly attracted to in some way. The scenes jump from one guy to the next, and each help her move on in an important way, including turning back to God. The ending was just as messy, however all the chaos, lack of communication, and uncertainty felt very realistic and eventually it all came together.